CRYSTAL QUEST Whole House Nitrate 2.0 Water Filter Systems are engineered for maximum filtration and maximum performance with minimum maintenance. They deliver trouble-free operation for many years. It is the most advanced and effective Nitrate water filter in the market for the following reasons: First, water travels through a 20-inch sediment cartridge that removes sediment, silt, sand dirt. This also prolongs the life of water softeners, water filters, and prevents damage to control valves or pumps. Next, water travels through a 1.5 or 2.0 cubic foot media tank with an Automatic Microprocessor Control valve. (The longer time that the water is in contact with the media, the more effective is the conditioning and filtering of the water.) Finally, water travels through a 20-inch solid carbon cartridge for a final conditioning of the water and removing any remaining contaminants and VOCs which may be in the water. 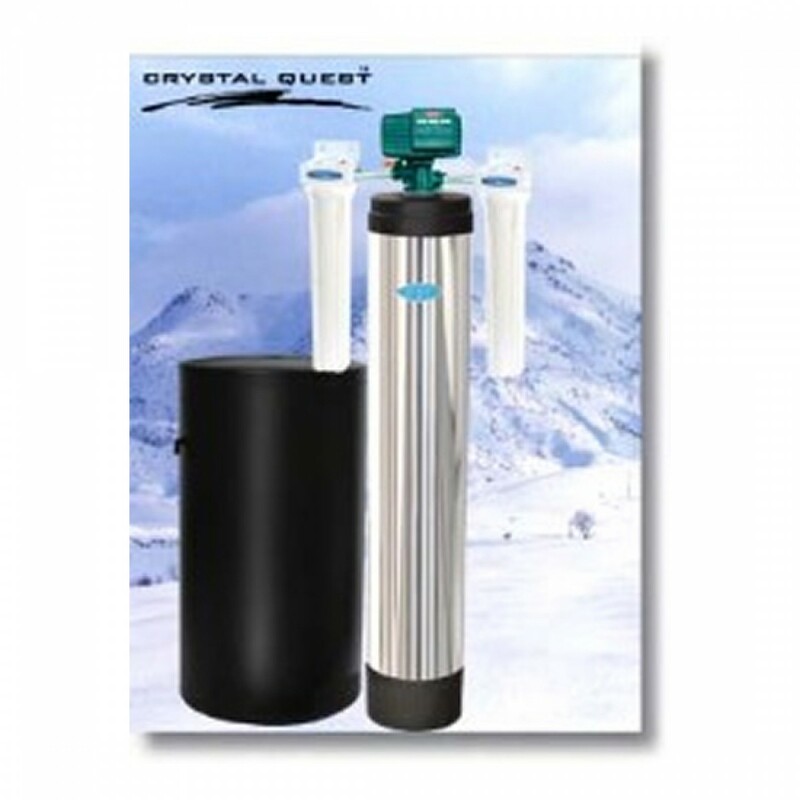 CRYSTAL QUEST Whole House Nitrate water filters are: Simple, user-friendly, easy to program, dependable, fully shipped with filtration media already in the tank. The system connects to the main line of your home and filters all the incoming water to it. It requires a nearby power outlet and drain source (usually the washing machine drain). They come complete and ready to be plumbed in. All Whole House Nitrate water filters include the following: 10 year Warranty on resin tank and brine tank assembly, 30 Day Money Back Guarantee, 5 year warranty on all Computer Monitored control valves, Low voltage transformer, and a bypass valve. Nitrate (NO3) comes into the water supply through the nitrogen cycle rather than via dissolved minerals. It is one of the major ions in natural waters. Most nitrates that occur in drinking water are the results of runoff from fertilizer use; leaching from septic tanks, sewage; erosion of natural deposits. Nitrate is reduced to nitrite in the body. The US EPA's MCL for nitrate is 10 mg/l. CRYSTAL QUEST Whole House Nitrate 2.0 Water Filter System features 3 stages of filtration. in the first stage, water flows through a 20-inch sediment filter cartridge that removes sediment, silt, sand dirt which also extends the life of water softeners and water filters and prevents damage to control valves or pumps. in the second stage, water flows through a nitrate-reducing mineral tank. Finally, in the third stage, water flows through a 20-inch solid carbon cartridge that removes volatile organic carbon compounds (VOCs, insecticides, pesticides and industrial solvents). CRYSTAL QUEST Whole House Nitrate 2.0 Water Filter System also features: A Poly Glass mineral tank, Riser style 1-inch internal flow distributor, a solid state microprocessor with LED display Electronics control valve, Chrome sleeve/jacket--Polyester fiberglass tank and a Stainless Steel Bypass Valve.